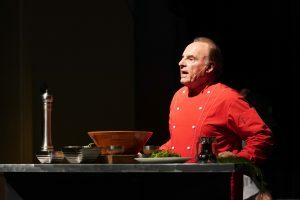 He is a best-selling author and cooking icon, thanks to the success and ongoing popularity of his timeless book, Sing and Cook Italian, and his unique cooking-cabaret shows. Since his childhood days in Newark, NJ, Andy has had a intrinsic gift for creating both music and food. He was extremely close with his large Sicilian family and recalls being in the kitchen as a child and watching his grandmother Grace cook. As soon as he was tall enough to reach the table, Andy was cooking meals for himself. At the age of 22, Andy signed with Epic Records and recorded several popular jazz standards. Listen to The Singing Chef’s first record: Side A – The Great Magic of Love and Side B – Dancing Master. He later moved to California where he studied with world-renowned vocal coach, Giovanna d’Onofrio. Under Giovanna’s tutelage, Andy studied all of the arias and love songs of the great Italian composers. 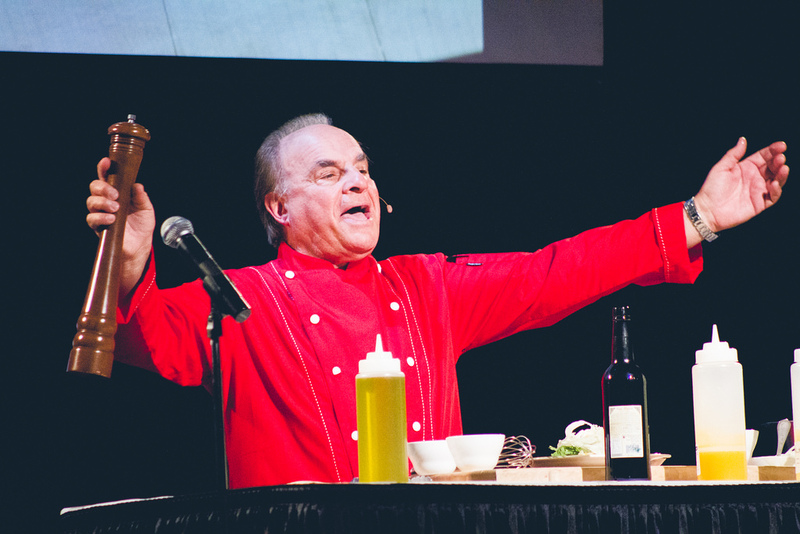 In 1991, Andy invented a way to combine his passion for music and food by cooking his family’s best recipes to classic, beautiful love songs, and thus “The Singing Chef” was officially born! 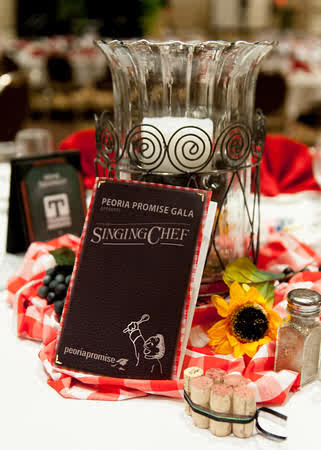 These days, “The Singing Chef” spends more time on the road than at home, traveling around the world as a featured performer at state and county fairs, at Italian festivals, at various trade shows, as well as at casinos and resorts. 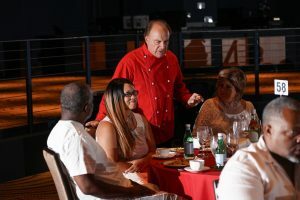 In addition, for his more savory fans, Andy caters “Sing & Cook” lunch and dinner shows for a steady stream of tour groups at high-profile restaurants across the country. His talents have been showcased by numerous national and international media outlets including, The Food Network, The Donny & Marie Show, and numerous local morning TV features. Though Andy has a penchant for authentic old-fashioned cuisine, he has managed to modernize his act by recently launching a new CD entitled, Cooking Cabaret: An International Cooking Musical. 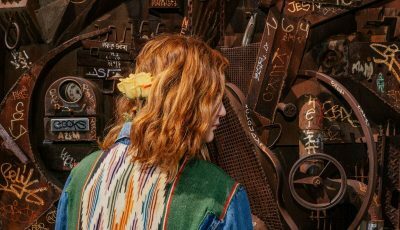 The musical will soon be making its theatrical debut at performing arts centers and theaters all over the United States and Canada. Andy is also in the process of producing a TV pilot for a show that will dramatically reunite estranged families by inviting them to recreate original family recipes while singing and cooking together. Where does this interview find you now? At the moment I am in Montecito, Ca. in the Santa Barbara area working on some projects that are in front of me now and booking my performances for my 2019-2020 year. Now that we are into the 4th month of the new year, how has 2019 been treating you so far? What are some goals that you have for yourself this year? How are those New Years resolutions going? Yes it is the month of April and many of my favorite spring flowers are in bloom as well as my creative juices. I have made lots of new contacts and friends within this first quarter through my social networks like Linkedin and Twitter as well as Facebook. I have had two streaming PODCASTS, April 1st and April 6th from Twitter connections with two very well followed interviewers and radio personalities. One from the USA, Florence and Jim on The Forum and the other from a popular London radio station Sam Britton HFM 102.3. Growing up, how important was music in your life? Can you recall the moment when you decided that you would be a musician? Was it easy or difficult choose to make? For me music was always around me when I was growing up in an Italian American family. My first cousin Phil Brito was and international radio star and singer on a New York Italian radio show that my grandmother would listen to as well as her putting on some of the great tenors and sopranos of her time while she was cooking some great homemade Italian food. My uncles on my Mothers side all played instruments guitar, accordion upright bass, piano and when I was old enough I added a small drum set with cymbals. They also played at many weddings and events like nightclubs and lets not forget the big family picnics we had once a year. Was there ever a time when you thought about doing something else? If you weren’t a musician today, what else could you see yourself doing? Would you be as fulfilled in life? Maybe a pro cycle rider in the Giro de Italia or the Tour de France, but I always seemed to love entertaining. 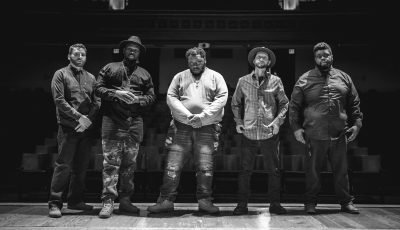 I would not only sing on the street corners with a group of other guys acapella and on some weekends play at high school fraternity parties with my four piece band called The Avantis. What has been the biggest surprise so far about making music and cooking your carrier? What has been an unexpected or welcome challenge to it all? How would you say that you are able to balance the two? Ever since I made the decision to mix my two passions together with my love of good food & singing, it has been a fun ride. 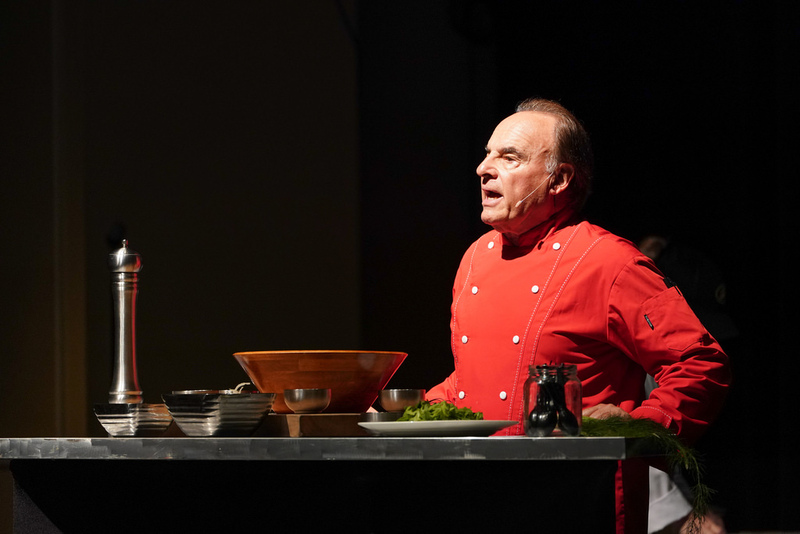 Now with two best selling cookbooks, Sing & Cook Italian, and my recent 25th anniversary cookbook, Sing & Cook with Andy LoRusso The Singing Chef, both come with my That’s Amore CD so people can sing while they cook. Both on Amazon.com, many doors have opened up for me and the surprise is what I have created has been very well received all over the world. Regarding balancing the two is has its challenges at times but I do take time to meditate and take long walks in nature to help balance my mind and body. Yoga helps also. My home town had many entertainers that became well known, like Frankie Valli and the Four Seasons, Count Basie, Barbara Streisand, Bruce Springsteen, Jon Bon Jovi, The Young Rascals. When I moved to California the Beach Boys, who, I know Mike Love and Bruce Johnson personally, were always on the radio. What is some new music that you are currently working on? What has been inspiring your music lately? I am always trying to stay in the moment and listen to my heart and pick up pieces of melodies that I hear when I am walking in nature or riding my bicycle in the mountains. It could be something I hear someone say, maybe a poem that moves me, or a beautiful woman, or the aroma of the Spring flowers in bloom, and the longing to give love and be loved and to share the message to the world that we are all one and truly want the same things. What has changed about your style of music? How has your creative process grown over the years. 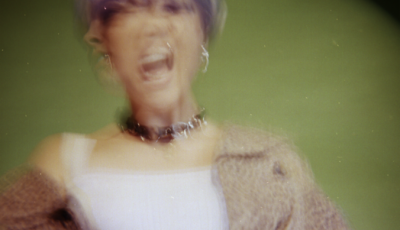 When I find myself living more in the moment and having a creative muse hit me, I try to record what I am feeling or singing as soon as I can without the judgement of the intellect stepping in. to keep it as pure, a pure form of creativity. I am working on a few projects now that not only include the music and food from different cultures but also to include the children of those cultures and have them experience how music and food is a universal language and brings the whole world together. What has it been like keeping up with your social media accounts and all of the different platforms? Is it hard to stay up to date on it all? At present I have stepped up my Twitter activity and my Linkedin accounts and have been getting some good connections for my global family. Who are some of your favorite artists or rather, what musicians have continued to inspire you and your music? Who would you absolutely love to work with in the future? I have a number of artists who I listen to and it all depends upon the mood I am in at the time. Romantic: Andrea Bocelli for his ability to embrace a number of different languages and create a new following for many classic songs. Energetic: Earth Wind & Fire, Santana, Gloria Estefan because they continue to inspire me and others to dance whenever we can. I also am inspired by my new friend from New Zealand that I connected with on Twitter, Emme Lentino. She is a creative song writer and musician and comes from the heart. There are many more artists I like but I will stop there. As far as entertaining with, I love Donny & Marie for I worked with them before on their TV show. Also Celine Dion who has a great vocal range and also comes from the heart. Where can fans see you next? If you were going to be stranded on a deserted island, what musical item would you take and why? If stranded on a deserted island I would bring or make a large drum not only to help people locate me by beating on it but also to use as a cooking pot to eat with, Ha Ha. If your music was going to be featured on any TV show that is currently on right now which you love to be on? Or if you prefer, what is a movie that you love that you wish your music was featured in? Regarding a movie that I wish I wrote the music for would be The Godfather and Star Wars. I would like them to always carry the tune in their heart and mind and to have the songs as a testament and legacy to inspire them to remember to celebrate each day for life is so precious and fragile and to try to celebrate each day and sing and dance whenever they can. Would you like to share anything else with our readers about your self? I do believe in God and Rock & Roll and the kindness of humanity. It’s love that keeps it all together.